For an intelligent person, I don't always make terribly smart decisions. 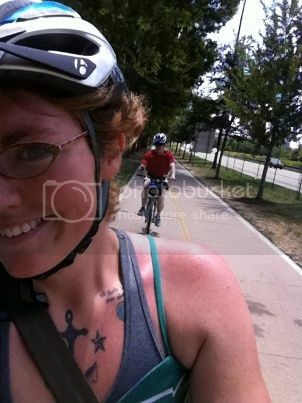 I could provide infinite examples, but recently, it was a long bike ride along Chicago's lakefront trail. The bike ride itself was a great choice: we rented bikes at a park downtown and rode south to the Illinois-Indiana border. There, we wondered: could we ride the length of the city? 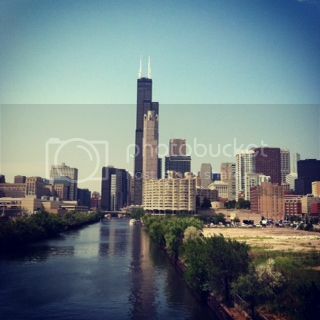 Back north to where we started, then continue to the Chicago-Evanston border? Still, not a bad decision. It was a long ride, over 42.5 miles, but we're fit and active people. A challenge, but within our reasonable limits. The bad decision related to the 4+ hour ride was actually before we started, when we forgot the sunblock at home. We had big plans for his few days off: use a few Groupons I'd bought a while back for various ethnic restaurants and activities like bowling and reserved time at a tennis court, be active, explore the city a bit. Instead, we spent it all in bed, and not in a fun and enjoyable way. More of a "he's as red as a lobster and my back is covered in blisters and it hurts to even move" kind of way. After a day or two, I tried to put a dress on and head to the grocery store since we were out of fresh produce, and the pain was excruciating. We ate the pulled barbecue chicken plain instead of tossing it up with broccoli slaw like I'd planned, and I decided to try again the next day. Thursday morning, still no luck - trying to put on anything more restrictive than an oversized t-shirt with a shoulder and back covered in blisters was tear-inducing. I couldn't leave the apartment, because I couldn't even get dressed. Not awful, except that I was registered to run the Bastille Day 8K that night. It hurt to get the sports bra on, let alone run nearly five miles with it on. It didn't matter how slow I ran, I was out there, running. But Thursday night, I didn't finish last. I didn't finish at all, because I didn't start. My first ever DNS. It wasn't about the lost cost of the race entry, or about missing my first race back as a Chicago resident. It was a feeling of overall frustration and disappointment in myself. I shrugged it off and tried my best to come off as okay with what was clearly the necessary decision, but still, I was hurting inside. This morning, I woke up feeling better, though the blisters were still extremely present. At least I could get mostly dressed - modifications were needed with the bra, but I looked halfway decent, so I could get to the grocery store to restock our fridge. Tons of fresh produce, chicken breasts, Greek yogurt - everything good. Except one thing that wasn't. Another poor decision. Knowing full well that overeating doesn't solve anything, I still chose to do it in reaction to my feelings of stress, anxiety, and disappointment. It felt the way it always does - comforting for a very short time, and then I feel just as empty and unsatisfied, and now guilty as well. After the mini binge, it started to rain, so I tried to keep myself busy doing a few things around the house - cooking some chicken for a few nights' dinners, applying for a few more jobs, whatnot. I felt stir crazy, and knowing I needed a few things at Target, I headed out again once the rain had stopped. I should have stayed home. Razors are not an emergency. Shaving my legs is not a huge, pressing issue - especially when I am exceptionally vulnerable and susceptible to a binge. But I went out. I got through the end of my days in Merced without a binge. I got through my first days in Chicago, too, with cereal and peanut butter and several other problem foods kept in the house - not a single problem! Such a success! But today, something snapped, and I felt completely powerless to my addiction. I'll spare the details. But oh, it was bad. Sickening, unhealthy amounts of food - of course, not healthy choices to begin with - and all consumed so quickly. I felt awful afterwards - for letting myself down, for failing my own Hundred Day Challenge, and for being so sneaky about it all ... I waited to go out again not only for the rain to subside, but until Matt had fallen asleep - and I didn't say anything about it when I recapped my day before he headed to work. 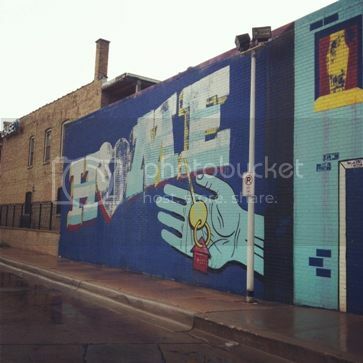 Moving to Chicago brought with it a lot of stress, both positive and negative. Even positive stress, though, affects a person. I told myself before leaving California that Chicago wouldn't be a cure-all for the issues that re-manifested themselves over the past year, that moving would facilitate getting back on track, but there would still be a good amount of work to be done, and I would need to assume responsibility right away. Still, I guess I was hoping for a miracle. That I'd get here, and that things would be easy - or at least easier than in California. That my runs would be perfect from the get-go, that the scale would finally start dropping, that I would turn to my friends and family instead of food when times got tough. I wanted to get to Chicago and "hit the ground running," so to speak. But it hasn't worked out that way. I've had a lot thrown at me the past two weeks, most of which I had not foreseen. The ongoing job search, hoping that something will work out soon - that I expected. But the apartment debacle, and now sharing a room with Matt until the end of the month ... getting a cold, then fainting, and now the second-degree sunburn. It's been very taxing. I have a lot on my emotional plate right now; the proper way to deal with it all is not to fill a physical plate. But when I feel overwhelmed, I can't think about anything but how good it feels to be high, if only temporarily. I still have so, so much work to do with regard to resolving my food issues. I'm finally in the right place physically - now, to work on the mental components. To focus on positives: three and a half weeks binge free is the longest streak I've had since leaving Chicago last summer. It's something to be proud of, even if I'm upset and frustrated that tomorrow is yet another Day One. I have a roof over my head and enough savings to last a while. I have an amazingly supportive partner and incredible friends, all in the same city as me now, to whom I should be able to turn and say I'm struggling, I'm hurting, I need help. I have the tools and a wonderful support team. Now, to make sure I use them when I need to. Step one, first thing tomorrow morning, I will make a new binge jar. Back in a city with lots to see and do instead of binge eat? It worked before, it will work again. A very smart decision, indeed. 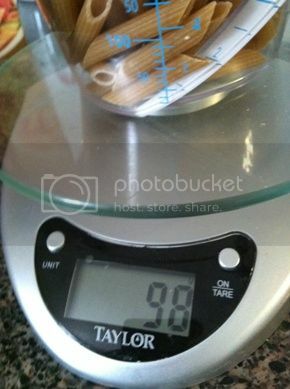 I got a few comments and e-mails on my last post regarding Matt mismeasuring his pasta, so I thought it would be a good idea to share a post that showed the difference between liquid and solid measurements! 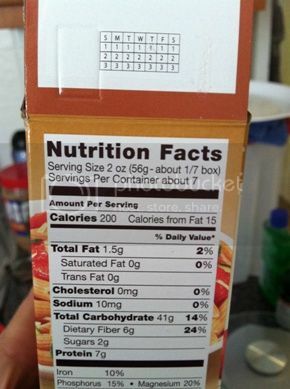 They say a serving is 2 ounces, or 56 grams. 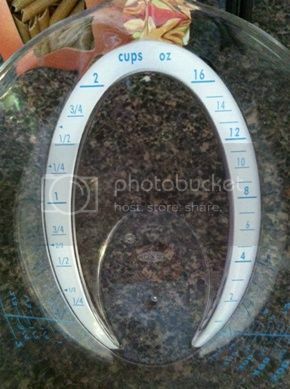 Often, you may also see the serving in cup measurements, usually 2/3 of a cup being a serving. So, before a run, Matt would take his measuring cup and measure out 8 ounces, what he figured to be about 800 calories. 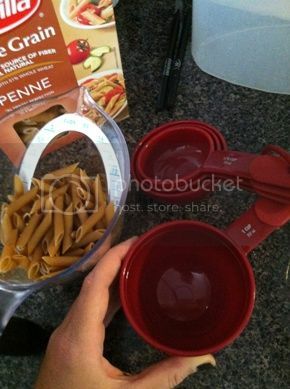 The problem, though, is that this is a liquid measuring cup - and pasta is clearly a solid. The 2 ounce serving is not 2 liquid ounces (for comparison, a shot glass is typically about an ounce, ounce and a half) but 2 ounces by weight. But the most accurate way of measuring is by weight. I set up a scale to subtract the weight of the cup, and lo and behold, we find that Matt was eating far less than the 8 ounces he thought he was eating. It was actually 3.4 ounces by weight, or 98 grams. 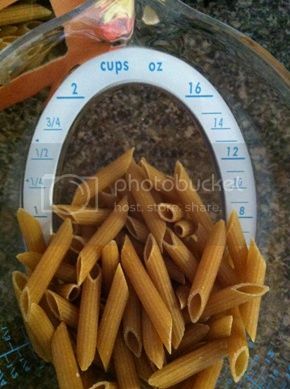 Since a serving is 2 ounces or 56 grams, the bowl of pasta he'd been logging as 800 calories was, in fact, only 350 calories. Needless to say, I think we've figured out why he dropped a ton of weight in the past month and a half or so! Everyone has his or her own method for losing weight - counting calories, counting Weight Watchers Points, etc. - but no matter what works best for you personally, it's still important to have an understanding of portion sizes. I bought a food scale a few months ago and used it for everything for a while, until I got a good idea of what serving sizes looked like. I don't see the point in neurotically measuring every piece of fruit, every plate of veggies, every chicken breast - after a while, you can more or less eye it, and the difference between a 90 calorie banana and a 110 calorie banana isn't worth losing sleep over, at least not to me. 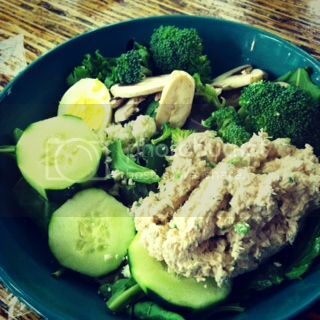 My issues with weight loss in California had nothing to do with small differences in fruits, veggies, and lean protein. Things I *do* still measure, though? Nuts and nut butters. Avocados. Pasta. Things that are more difficult for me to estimate, or that I tend to go overboard with if I don't have a structured plan in place. I don't know if I'll measure these things forever, but I know that for now, I need them to be weighed out. What about you? 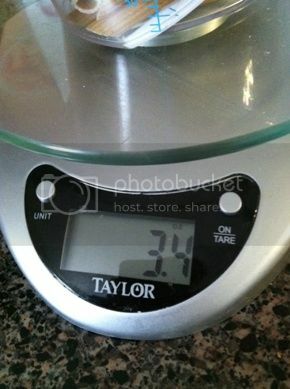 Do you weigh/measure your food? Do you weigh/measure everything, or just some things? Have you ever made any big over/under estimations about foods? Given the craziness of the past week or so, I'm pleased with my progress so far.﻿ I got off the plane a little more than a week ago with a bit of a tickle in my throat, and it turned into a full-blown cold - barking cough, runny nose, sore throat, fever. It took almost a full week to pass, and the first half of the week my energy felt almost entirely depleted. I've still been running regularly, three times a week as usual for my training schedule. After my failed 10 miler, I decided to slowly work my way back up - to not say "I will run 10 miles today" but rather, to say "I will run today" and then do what I can. A five or so mile run a few days ago, 8.25 miles yesterday. Between the sickness and the heat wave here in Chicago, I'm just glad I've been consistently running, even if my long run is a bit short of what I had scheduled. Absolutely no worries. The heat has let up, thank goodness - yesterday's 8 or so miles were done early in the morning, perfect running temps ... about 20º cooler than it had been earlier in the week! Staying hydrated has been crucial - the worst day was a few days ago, when temps hit 105º. We laid low and hung out in the air conditioning all day, but decided to go out at night; the coolness of the AC had been deceptive and I wasn't nearly as well hydrated as I should have been. We went out on a double date to a jazz club - totally lovely, until I fainted. Luckily, the worst injuries were to my ego - a bit of soreness on my face, a little scratch under my eye, and bruised knees, but those aren't terrible. Katie from my Ragnar team had an experience fainting a few years ago that left her with a broken jaw! The good thing about the heat wave, I suppose, was a huge NSV that came of it: I invested in some real, honest-to-goodness shorts. Not capris. Shorts. Three pairs, even (thank goodness for Old Navy and 4th of July sales!). And yes, I have a ridiculous tan line from running outdoors in California all winter. But oh! how liberating it was to walk around in a tank top and shorts and not care at all about thigh jiggle or loose arm skin! I totally love my legs - they're sort of incredible, and the few trouble spots on my thighs will certainly improve with continued weight loss. But I'm a bit sensitive about the arms - the loose skin isn't horrible (given how big my arms used to be, I'm really quite surprised they're not much more dangly), but the stretch marks are plentiful. Still, when the day comes when I'm ready for my skin surgery, the arms aren't on my to-chop list. It's not painful like the stomach skin, but rather, something I simply need to make peace with. My eating has been okay - I'd give it a 7 out of 10. No binges in nearly three weeks, which I am very proud of (as anticipated, the move has been a source of both positive and negative stress, but I've kept my cool and haven't used food to self-injure). I'm getting used to a new home, though, and a new neighborhood, so many of my meals have been eaten out - pretty good choices, like sandwiches from Trader Joe's and salads from Whole Foods, but these are both (a) costly long-term and (b) not what I'd like to be eating regularly. I can make a great salad at home, I just need to have the ingredients on hand. We went grocery shopping yesterday and got lots of lovely produce, lean meat, Greek yogurt, and whole wheat pasta. I'm looking forward to cooking more at home starting this week - today's project is to scour a few of my favorite thrift stores for pots and pans (I brought a few from California and Matt has a few here, but we need things like a roasting pan and glass baking dish). It's been a good first ten days. Living with Matt has had its lovely moments - he's been amazingly supportive, and a terrific sport about trying new things: avocado (didn't like it, not even as guacamole), cherries (liked), apricot (liked), hummus (liked, but made a face when he found out it was made with beans). And he learned that there's a difference between liquid and solid measuring cups (he thought he'd been eating 8 ounces of pasta - but was using a liquid measurer. By weight, it was less than half that, actually! No wonder he dropped a ton of weight the past few months - eating half the calories he thought he was!). But it has also had its fair share of challenges - it's so lovely to wake up with him so often after so much time apart, but at the same time, we went from not seeing each other for weeks or months to cohabitating, so there's been a little friction, albeit very minimal. Luckily, we work well together as a team, I think, and have been pretty good with communicating our thoughts and our needs. We've found ways to make it work while sharing a small space until his roommate moves out at the end of the month and I am finally able to set up shop in my own corner of the apartment (I care about him very deeply, but I also know myself very well, and I know I need a good amount of alone time and my own space where I can escape). So, things are quite good. My goals for days #11-20 are to keep up the binge-free streak, to get better about not weighing daily (I intended to only weigh every 10 days, but when stress kicked in, I weighed - it's a habit that needs breaking, but at least it wasn't a binge), to reduce premade meals and avoid the temptation of the salad bar, and to stay hydrated. What about you? How are you doing with your challenge goals? What are your goals for the next ten days? What NSVs are you celebrating this week?